Holy scriptures of Rigveda praise Lord Rudra as “the mightiest of the mighty.” Performing Rudra homa by invoking Lord Rudra can dissolve fear and worry and provide protection. Rudra homa, dedicated to Lord Rudra, who is a form of Shiva of the holy trinity. When the homa is performed, it harnesses the positive energy of Lord Rudra and can bring you the blessing of spiritual empowerment and help overcome the negative influences of Nava Grahas (Nine planets). 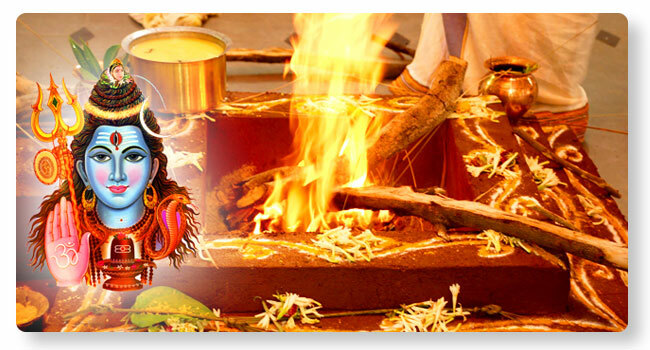 Rudra homa cleanses the aura of the performer, eliminates dark malefic forces, removes fear and uncertainty. The spiritual energy generated by this unique homa can bring about life-changing positive effects.